Apple revealed and released its new MacBook Pros on Tuesday. The new line of Retina MacBook Pros consists of five standard configurations, three 13-inch models and two 15-inch models. 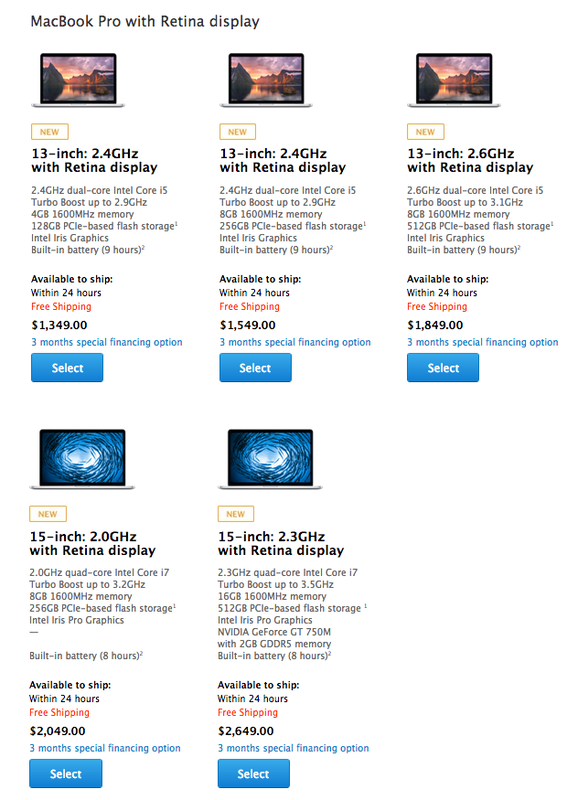 The new 13-inch Retina MacBook Pro features Intel’s fourth generation dual-core Haswell processor, Intel’s Iris graphics, new PCIe-based flash storage, and Thunderbolt 2 which is capable of data transfer rates of 20 Gbps. The 13-inch Retina models start at $1349 with a 2.4GHz dual-core Intel i5 processor, 4GB of RAM, and 128GB of flash storage. The 15-inch Retina MacBook Pro steps it up featuring Intel’s fourth generation quad-core Crystalwell processor and Intel’s Iris Pro graphics with the top end model gaining discrete graphics in the form of Nvidia’s GeForce GT 750m with 2GB of dedicated video memory. The 15-inch models also get the faster PCIe-based flash storage and Thunderbolt 2. The 15-inch Retina models start at $2049 with a 2.0GHz quad-core Intel i7 processor, 8GB or RAM, and 256GB of flash storage. The new Retina MacBook Pros are the first computers to ship with OS X 10.9 Mavericks. Mavericks is a free upgrade for all existing OS X users. Apple also released brand new versions of its iWork and iLife suite along side Mavericks. 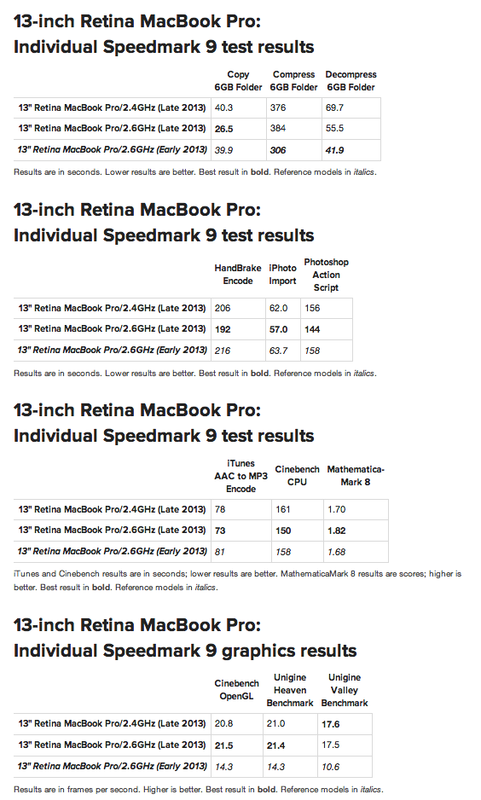 Macworld has taken an early 2013 13-inch Retina MacBook Pro and ran some test on it to compare it to Apple’s latest version of its 13-inch laptop. This early 2013 model has a 2.6GHz dual-core Ivy Bridge processor, 8GB of RAM, Intel HD 4000 integrated graphics, and 256GB of SATA-attached flash storage. The test were run against the newest entry-level 13-inch Retina MacBook Pro and the new top of the line standard configuration 13-inch MacBook Pro. The results show significant, 40 to 50 percent, improvements in graphics performance thanks to Intel’s Iris graphics. The newer models also showed about a 65 percent improvement in frame rates over the earlier models. Intel’s new fourth generation Haswell processors showed a 5 to 11 percent increase in performance. The new PCIe SSDs have also shown some significant improvements. The top of the line, 2.6GHz 13-inch Retina MacBook Pro with 256GB of flash storage was 33 percent faster than the early 2013 13-inch Retina MacBook Pro. Interestingly, the 128GB PCIe SSD in the 2.4GHz late 2013 model wasn’t any faster than the SATA SSDs in the early 2013 model. The SSDs were tested using Blackmagic’s Disk Speed Test and the 2.6GHz late 2013 model was almost twice as fast in the write test as the 2.4GHz late 2013 model, 710 Mbps vs 315.9 Mbps. The read speeds were closer with the new 2.4Ghz model coming in at 700 Mbps and the new 2.6GHz model reading at 733.9 Mbps. The early 2013 model had a write speed of 393.1 Mbps, faster than the new 2.4Ghz model, and a read speed of 451 Mbps, significantly slower than the new 2.4Ghz model. The new 13 and 15-inch Retina MacBook Pros are available from Apple now and come out-of-the-box with OS X Mavericks, Apple’s latest desktop operating system. You can find a recap of the entire event here.